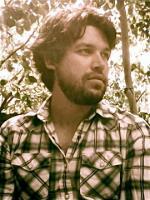 A recent transplant from Texas, Matthew Treon lives in Boulder, Colorado where he studies fiction in the MFA Creative Writing program at The University of Colorado. He is a music journalist, a staff writer for The Marquee magazine, the new Assistant Managing Editor for Timber Journal and teaches at the Boulder Writing Studio. His most recent story is forthcoming in SpringGun Press, and he is currently working on a twelve-volume non-fiction project titled Drinking Methanol: The Obscured Tommy Johnson and the First Blues Faustian Bargain.